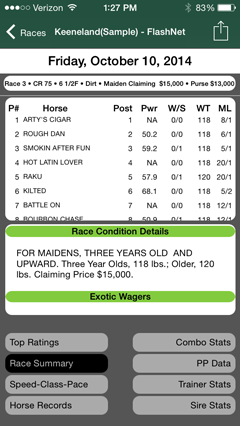 Pocket Handicapper Suite for iPhone is an all-in-one handicapping tool allowing access to a variety of TrackMaster products and reports delivered directly to your iPhone. 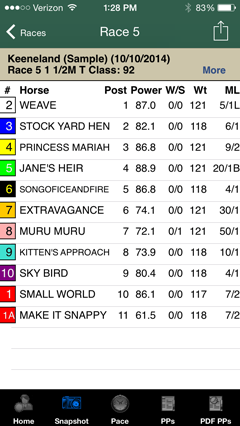 Users have the option to select any of the products below, which each come with a sample race card. Summarized speed, power, pace & class ratings & full PPs for each race. Detailed computerized analysis from selected tracks across the country. In addition to commentary on the choice plays and vulnerable contenders, the Turf Club Analysts provides straight win bets, exotic wagers and a race rating. 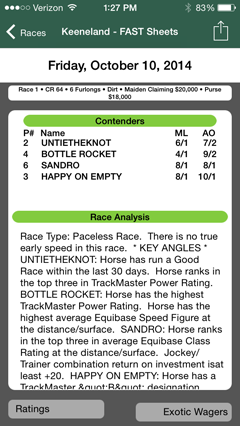 A handicapping report, designed for players of all skill levels, that helps to quickly and easily unlock the key information and stats inside each race card. 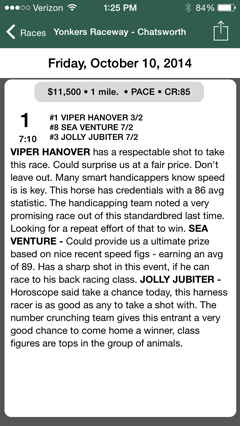 Selection report that attempts to model how each race will unfold based on pace scenarios and ratings and provides a contender list with an acceptable odds line. Basic selection report, along with positive or negative comments for each horse. 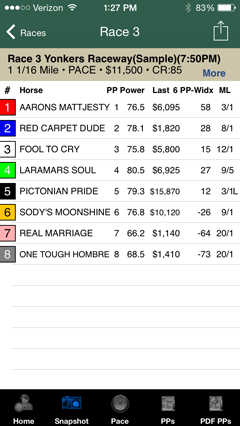 An automated selection service for Harness races developed by a group of experienced handicappers and data analysts with a combined 25+ years of experience. 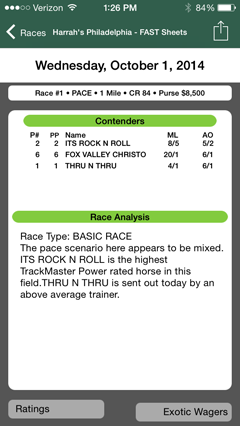 Typically provided are the best three value bets in the race, with supporting commentary. Pocket Handicapper Suite products can be purchased on a pay-as-you-go basis or convenient monthly unlimited plan, deducted directly from your iTunes account. AUTOMATIC RENEWAL FEATURE - If you choose one of the subscriptions options, it will automatically continue unless auto-renewal is turned off at least 24 hours before the end of the current period. Your credit card will automatically be charged for another subscription period at the current subscription price. You can manage your subscriptions and turn off auto-renewal by going to your iTunes Account Settings after purchase. Subscriptions cannot be canceled during the active subscription period. What exactly is the Pocket Handicapper Suite? This revolutionary iPhone app gives users access to purchase a variety of TrackMaster products all in one central place. 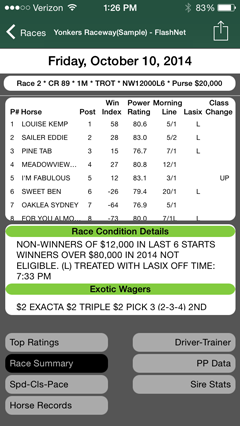 This one stop shop app is FREE to download and all the products included each come with a sample race card. 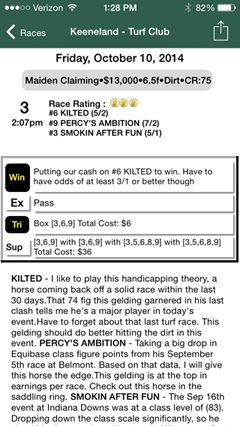 The best part is that all the important handicapping stats and data you need are with your whenever and wherever you go directly on your iPhone. Introduction - In this brief video tutorial, we will give you an overview of the Pocket Handicapper Suite. It provides a great introduction to this unique product and all the features included. 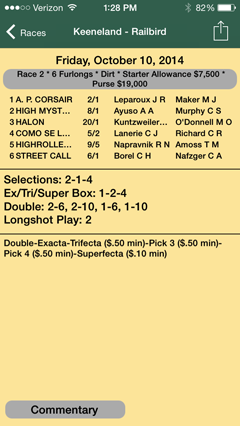 Pocket Handicapper Suite products are ONLY able to be purchased through your iTunes account.